The Govs (7-8) were down 8-4 as they came to bat in the bottom of the seventh, but got things going right away with Danielle Liermann hitting the second pitch of the inning out over the right field fence to make it a three-run game, 8-5. Liermann would finish the game 3-for-4, with a run scored and two RBIs. Allie Blackwood would follow with a single, move into scoring possession on a wild pitch, and two-outs later score on a single by Kendall Vedder to make it 8-6. Vedder went 2-for 3 at the plate, with three RBIs. But that would be as close as the Govs would get, with Emily Moore getting called out on strikes to end the game. Austin Peay would take an early lead on Campbell, scoring a first-inning run on a sacrifice bunt by Blackwood. Campbell would tie the game with a single run in the second inning and take the lead with two runs in the third inning and then extent that lead out to 6-1 with three more runs in the third. Austin Peay would cut the deficit to 6-3 in the bottom of the fourth on a two-run homer by Vedder, her second of the season, which also scored Christiana Gable; who finished the game with two hits. Both teams would score single runs in the fifth inning, with Liermann driving in Kacy Acree – who had reached with a double – making it 7-4. Campbell would score its final run in the top of the seventh. Kelsey Gross (5-3) would take the loss for the Govs, going three innings and giving up five runs on five hits, while walking one and striking out three. 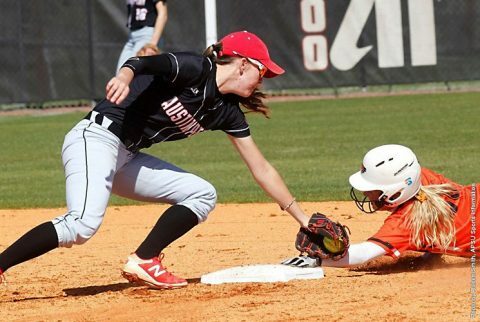 Austin Peay will return to action this weekend, as they travel to Murray Ky. to play in their final in-season tournament of the year, the Racer Classic.